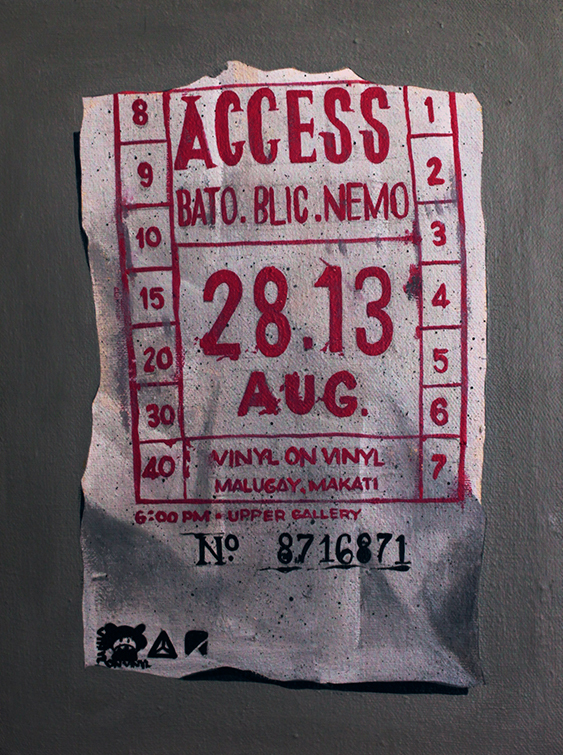 VINYL ON VINYL: ACCESS, A three-man show, next week, August 28, 2013, Wednesday! ACCESS, A three-man show, next week, August 28, 2013, Wednesday! Along with the hopes of a sunny day, catch ACCESS, a three-man show featuring Nemo, Blic and Bato, in Vinyl on Vinyl next week, August 28, 2013, Wednesday! For now, stay safe everyone! Communication has been the main soul of connection with one entity to another. A reality that enrich two edifice upon understanding each aspect involved; common goals, philosophy, feelings and other more complex matters such as religion and politics. Language have been the contrivance for communication, conversing of people with each other made a bond on unifying insights and ideology, creating vast power that inhibits ties with each other. Art is also one bridge on this connection, from the artist's perspective to the interpretative minds of the viewer, color combination as well as intensity, the brightness of each stroke, the thickness and impact of lines, the vast meaning that will be processed within our brains upon experiencing these connections. Three street and graffiti artists namely; NEMO, BLIC and BATO, members of Pilipinas Street Plan (PSP), merged to showcase these type of connections, with the sole reason of providing ideas as well as thoughts on what was happening within each one of them, different interpretation of their art, from their experiences on life as well as on streets, their ephemeral beauty which will provide the key to the doors of their creative and playful minds. Experience, translate and connect:access.